The Newest Rant: I Loved the Dark Wit of, "I Hate You--You Just Don't Know it Yet"
I Loved the Dark Wit of, "I Hate You--You Just Don't Know it Yet"
I was recently able to acquire a digital copy of the upcoming original graphic novel, "I Hate You--You Just Don't Know it Yet." 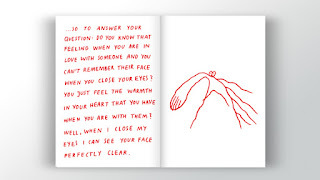 Published by the Germany-based Rotopol and written/illustrated by Nadine Redlich, it caught my eye with its quirky minimalist style as I of course love experimental comics. 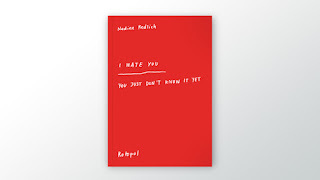 Having now read, "I Hate You--You Just Don't Know it Yet," I loved the cynical humor found within the book (that also has just a hint of heart). "I Hate You--You Just Don't Know it Yet," is a twisted love-hate letter of sorts, written to an unspecified romantic partner, describing how they are self-obsessed, ugly, remind the writer (Redlich never specifies any names) of all sorts of hideous things, make the writer behave in ways they normally wouldn't, but it is clear they still have an affection for their partner even though if things go wrong in the relationship there will clearly be a lot of rage. Considering how many relationships have ups-and-downs it is entertaining to witness Redlich's writer-character discuss the mixture of feelings they have in regards to their partner, from evaluating their love's appearance to questioning the etiquette of farting in one another's presence. Redlich's artwork tends to be minimalist-yet-expressive. Whether describing how her partner reminds her of a vase (then drawn as a toilet bowl), or using a drawing of a brick wall to illustrate the idea of personal boundaries, she only ever uses the color of a dark-red on otherwise bright-white space to create an attention-grabbing contrast. It works perfectly to get across her brutally-funny insights. You can pre-order a copy of, "I Hate You--You Just Don't Know it Yet," at Rotopol's website! Note: A copy of this graphic novel was provided by the publisher for the purposes of review.